What can Dr. Dan’s products do for people on chemotherapy? Some people on chemotherapy receive medications that can cause dry, chapped, painful lips and skin. 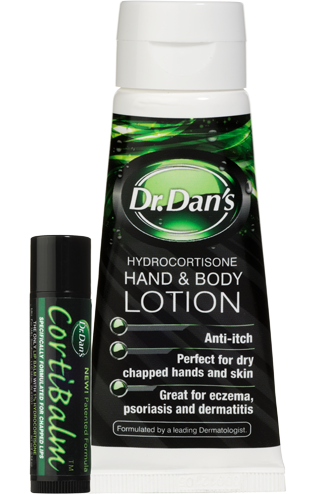 Dr Dan’s CortiBalm and Dr Dan’s Hand and Body Lotion can help relieve the symptoms of itching, burning, and cracking. As a result, the pain and stress associated with chemotherapy will be reduced. Chemotherapy is a term that is primarily used to describe the administration of various drugs or medications for the treatment of cancer. In addition, Chemotherapeutic agents can be used to treat multiple sclerosis, psoriasis, rheumatoid arthritis, ankylosing spondylitis, lupus, scleroderma, and Crohn’s disease. Chemotherapeutic agents act by killing rapidly dividing cells like cancer cells. They also affect cells in the bone marrow, digestive tract, and hair that contain rapidly dividing cells. The side effects of chemotherapy include shingles, herpes simplex, anemia, fatigue, hair loss, nausea and vomiting, organ damage, and sometimes death. Chemotherapy can cause many side effects including dry skin and chapped lips. The exact cause of these side effects depends on the type of drugs used. Often, side effects are related to the decrease in oil production by the glands in your skin. Many of the side effects go away after discontinuing the medication. Fortunately, treatment is available to reduce the discomfort associated with the dry skin and chapped lips. Dr. Dan’s CortiBalm and Dr. Dan’s Hand Lotion both work to reduce the dryness and inflammation associated with the use of chemotherapeutic medications. They can make the discomfort of going through chemotherapy treatment more tolerable.